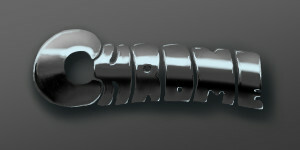 Damn i love this chrome! I can't wait to try out the new gradient tool... I usually don't bother delving into all of that, we all know I kinda muddle along with the basics, but from what I've seen done I think it's wonderful and I'll have to take the time to experiment and learn. I didn't even know the brushes angled until I saw the comments in the forum. Right now, though, I have to clean up the Triple Se7en powder I spilled on the dining room table before somebody lights a cigarette and blows my house up. It's some shiney stuff. I think people are going to go crazy with the new toy. I don't know what Triple 7 powder is Cindy, but Lord be careful, else you'll blow yourself up real good. I didn't use the gradient tool to do this. Well now I feel stupid, sorry Marcello.